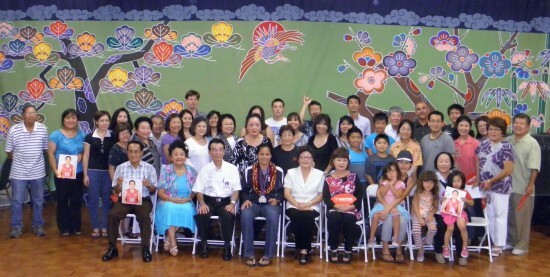 GARDENA — The Okinawa Association of America was treated to some bona fide star power on Sept. 7 when Olympic athlete Tamari Miyashiro appeared at a meet-and-greet in Gardena. 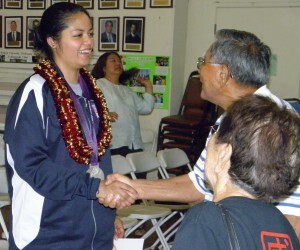 A member of the U.S. women’s volleyball team, which took silver at the London Games, Miyashiro signed photos, showed off her medal, and answered questions from fans. In the gold medal match on Aug. 11, the U.S. lost to Brazil 3-1. In the bronze medal match, Japan beat Korea 3-0. 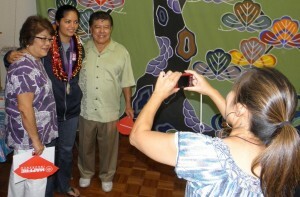 A native of Kaneohe, Miyashiro played volleyball for Kalani High School in Honolulu and was selected as All State in her junior and senior years. At the University of Washington, she was twice named National Defensive Player of the Year. The 25-year-old medalist, who stands 5-foot-7, comes from an athletic family. 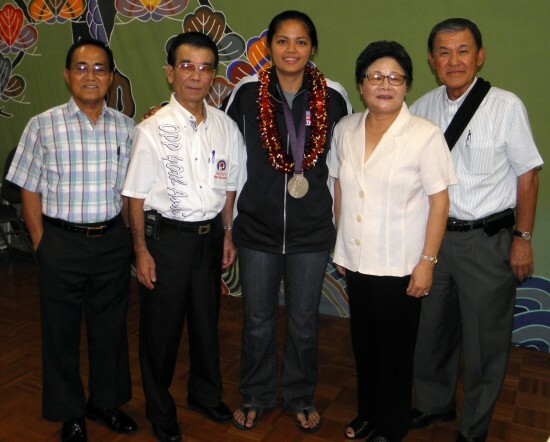 Her mother, Joey, and sister, Tehani, played volleyball for University of Hawaii; her father, Gordon, played football at Northern Michigan University; and one of her three brothers, Ainoa, played volleyball at Graceland University in Michigan. With Vicky Oshiro-Nishiuchi serving as moderator, she answered questions from the audience. 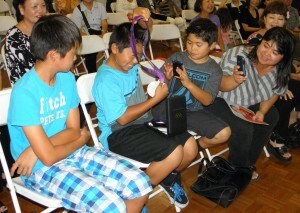 Miyashiro passed the medal around, and some in the attendees tried it on. “It’s pretty heavy …. Some of our teammates that got the silver in Beijing said this medal is huge compared to last time,” she noted. When Miyashiro took part in the opening ceremonies in London, it was “hard to believe” she was really there. As for the competition, she said, “Nothing prepares you for the Olympics. It’s prestigious, it’s intense, it’s exciting. I think you can also fall the farthest from the Olympics. It’s that high but also people call it the letdown … You can just hit this high, high point and then the next thing you know when you’re not playing, it’s like ‘Wow, what do I do now?’ That part you kind of have to juggle. There was very little down time, she recalled. “An off day was not really off for us. We still had to practice, we still had to train, we still had to get treatment, take care of our bodies and recover. We were there for about three weeks, we only played for about two weeks, so we played every other day. She did not attend the closing ceremonies, but saw them on TV. The show featured many classic rockers, such as The Who, that she was not familiar with. Also, the torch was passed to Rio de Janeiro, host of the 2016 Olympics. Miyashiro explained her decision to go for the gold again. “Before I went to this Olympics, I wasn’t sure if I wanted to. I was in a position where I could easily have been done playing … You spend so much time putting work in with the national team that you’re just drained … Then we went to the Olympics and now I want to go back and I want try to compete for real, see what happens. “Brazil is always a good team. They won the gold two Olympics in a row, so no matter when we play them they always play well … They’re a little bit like us in the sense that they’re not the biggest team, but they can just play volleyball really well. And in the Olympics that’s all that matters. She added that even talented teams, like Cuba and Germany, didn’t make it to the Olympics because the field was so competitive. When they are not on the road, the national team is based in Anaheim. Miyashiro said she is so focused on practicing that she spends most of her time either at the gym or at home, rarely leaving the city. 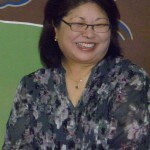 Attendees had an opportunity to chat with Miyashiro, get her autograph and have their picture taken with her.